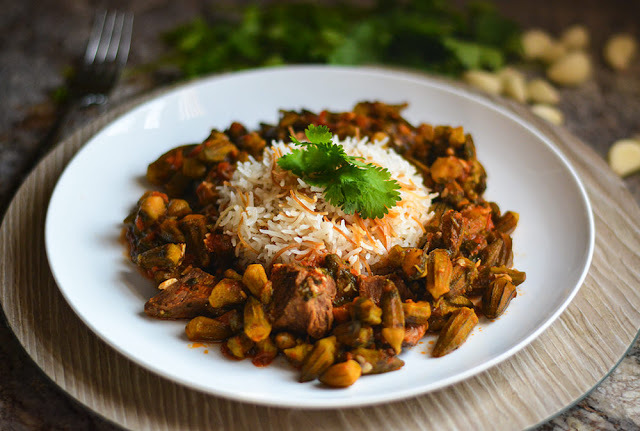 Okra stew is a favorite from the Lebanese recipes. This stew marries the distinct flavor of okra with a zesty tomato sauce & tender chunks of beef. Begin by boiling the beef. Add the beef to your pressure cooker and add enough water to cover the meat and a few inches higher. Do not cover at this time. Boil for 10 minutes on high heat. Throw away the first batch of water and rinse out the meat from excess fat. 1. Add 6-8 cups of water to the beef along with whatever you typically use to boil meat. I like to add a half small onion, 1 large bay leaf, 1 cinnamon stick, a few cloves, 2 teaspoons of salt, and ½ teaspoon of black pepper. Cover with lid and set the pressure cooker on the highest level over medium-high heat. Thaw the frozen okra for about 15 minutes. Heat up vegetable oil for frying. Deep fry the baby okra for about 8-10 minutes on medium heat until slightly crispy and light golden brown. Set aside until use. 3 Wash the fresh cilantro and cut off the stems. Finely chop. Crush the garlic with 1 teaspoon of salt using a wooden mortar and pestle if possible. Add the chopped cilantro and garlic to a large pot with 2 tablespoons of vegetable oil. Sautée for 3-4 minutes on low-medium heat. 5 Add the fried okra to the cilantro/garlic mixture and add enough beef broth to cover all the ingredients and a bit more (6-8 cups). Add the cooked beef, crushed tomato, 1 teaspoon of salt, ½ teaspoon of black pepper, and 1 teaspoon of dried coriander. Simmer on medium-low heat for 20 minutes. To make the rice, begin by washing the white rice 3 times in a mixing bowl. Add the vegetable oil to the pot and heat up for a minute on medium-high heat. Add the vermicelli noodles and cook until brown, about 2-3 minutes. Add the washed rice and mix well. Add the water and salt and lower the heat to medium-low. Cover and let cook for 15 minutes. Serve the okra stew with the rice and enjoy!